Alex Erro takes a swing. The sophomore is batting .285 this year, but the Wildcats are still 14-28 overall. With just two home runs through his first 45 games last year, then-freshman Alex Erro would have been considered one of the least likely sources for season-altering at-bats. But that May, the 5-foot-10 second baseman provided the three-run blast to clinch a series win at Purdue and the extra innings solo homer to finish a surprising series win at Maryland the week after. Then, in the Big Ten Tournament, Erro’s ninth-inning single culminated the Wildcats’ 3-run comeback over Michigan, a win that kickstarted their run to the finals. This year, however, it hasn’t been Erro who has provided the necessary spark in the season’s biggest moments. It hasn’t been anybody, and now, heading into this weekend’s series against Iowa (28-16, 9-7 Big Ten), NU (14-28, 4-17) is already eliminated from Big Ten Tournament contention. In last weekend’s series at Purdue, the Cats were swept and outscored 26-14, and they struggled to find any consistency against the Boilermakers’ pitching staff. Over the three-day stretch, the Cats only led twice, both in an 8-7 loss in Friday’s game. In that contest, junior shortstop and leadoff hitter Jack Dunn reached base in the ninth inning, but Erro and the heart of the order went down quietly behind him. 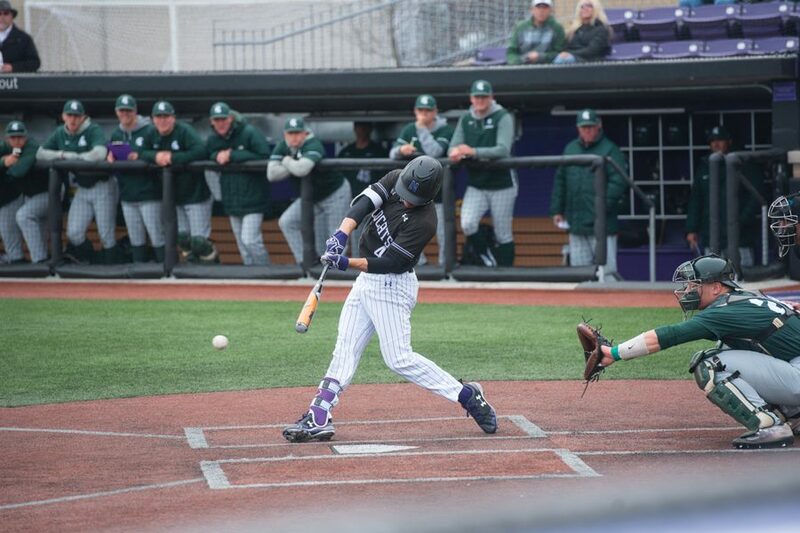 In recent contests, NU lost a game to Milwaukee that was tied in the ninth and left multiple runners on base in the eighth inning in consecutive close losses to Michigan State. Over the weekend against Purdue, those struggles continued, and coach Spencer Allen said he’s been frustrated with the offense’s inability to string together quality at-bats in meaningful situations. NU has only won two 1-run conference games this season — against last place Penn State — and the Cats are 0-3 in extra innings. The Cats’ inconsistency, Allen said, is the reason they haven’t been able to clear this hurdle. After his impressive clutch performance last season, Erro is hitting an extra-base hit on about 5 percent fewer of his at-bats this season, and his slugging percentage is down by 22 points. While his batting average and on-base percentages have improved, the second baseman hasn’t yet had a big moment that resembles the ones he regularly produced last year. Even though NU hasn’t had the same magic as 2017, Allen said he hasn’t considered making any drastic changes to the batting order or the rotation. Erro and the Cats’ other leading hitters — Dunn, junior first baseman Willie Bourbon and senior catcher Jack Claeys — have started at least 40 of the 42 games the Cats have played this season.